Our extra virgin olive oil is obtained by pressing different types of olives: Frantoio, Leccino del Corno, Moraiolo, Pendolino-piangente, Morcaio. Buy quality olive oil, buy now our extra virgin ! Our olives are picked by hand with the aid of combs and nets between late October and mid-November. 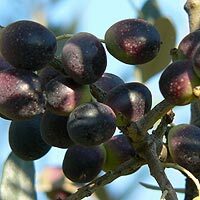 The harvesting period depends on the variety and maturity of the olives. They are carefully selected and within a few hours sent to the press, where they are subjected to cold pressing. The very high quality of our extra virgin olive oil is due to the nature of the soil in which our trees are planted, the early harvest and also the first pressing. The olives we use to produce our oil come from olive trees planted on our property ONLY: buying our oil means to be sure to bring to your table an extra virgin olive oil which is 100% Italian and – especially in our case – the authenticity and goodness of 100% Tuscan olive oil. The percentage point of acidity of our extra-virgin is approximately 0.20%. This very low percentage point of oleic acid proves the high quality of our product (the maximum threshold set by the law is 0.80%). Only the best oils can be classified as “extra virgin”, they must be produced entirely by mechanical means without the use of any solvents, under temperatures that will not degrade the oil and contain a free acidity, expressed as oleic acid of not more than 0,80%. 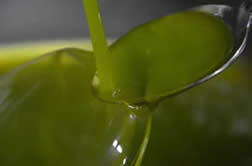 In order to prove its high quality, our Extra Virgin Olive Oil was subjected analysis. Click here to view the Chemical Analysis in detail. – special care and elimination of infected plants. Our extra virgin is obtained by crushing fresh, first quality olives ONLY, which are picked and immediately subjected to cold pressing, and have not undergone any other treatment in addition to washing, separation from twigs and leaves and centrifugation. 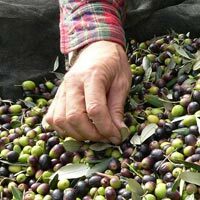 The climatic and environmental conditions, the varieties and methods of cultivation of our olive trees, the fruit picking, the right degree of ripening and the skillful pressing procedures are the elements that determine the quality of our extra virgin oil: its harmonious taste and fruity aroma, characterized by hints of artichoke and thistle, of freshly cut grass and almond mixed tobitter and spicy notes are indicators of a great natural product, rich in polyphenols – powerful antioxidants – which preserves all its healthy properties. To find out and learn more about the health benefits of extra virgin olive oil CLIC HERE! Buy Italian best olive oil, buy now Tuscan finest olive oil!